​This is a unique opportunity to adopt a painting from the Victoria Art Gallery’s collection, to restore it to its former glory and to see your name credited alongside the picture whenever it is displayed. The Adopt a Picture scheme is unique in allowing an organisation or individual to take a work needing conservation under their wing. The adopter covers the costs of restoration – sometimes for as little as £120. If you pay UK income tax, your contribution will be enhanced under the Gift Aid scheme by channeling it through the Friends of the Victoria Art Gallery, a registered charity. For a modest additional sum (£140 including VAT) we may be able to arrange to lend you the restored work for one year. This cost includes two-way transport of the adopted work to within a 15 mile radius of Bath. Click here to watch our Adopt a Picture video. 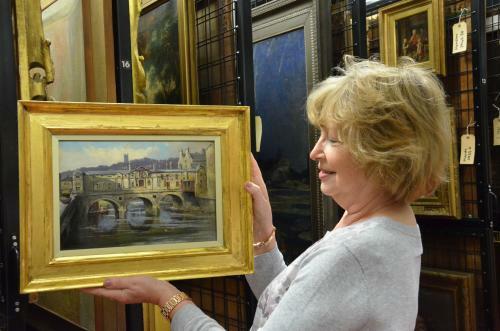 Here is Christine Milne holding the restored adopted painting of ‘Pulteney Weir’ by John Fullylove. The picture was adopted by her daughter Jill Brown for her mother’s birthday. Christine Milne was delighted by her present which was cleaned and reframed and can now be displayed for the public to see.